Something strange has happened with my field notes over night. The times for all the logs has changed which has in some cases changed the date as well! 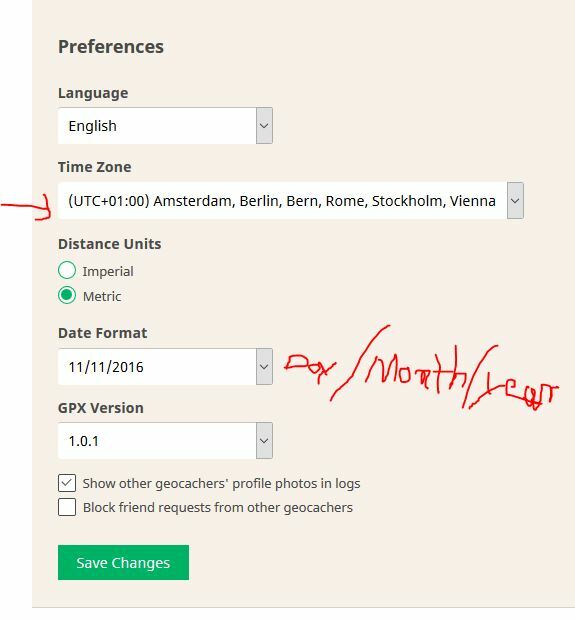 My setings on geocaching.com still show the correct time zone for me. And the times in my geocache_visits.txt file are correct. Is this something anyone else is experiencing? Yes. 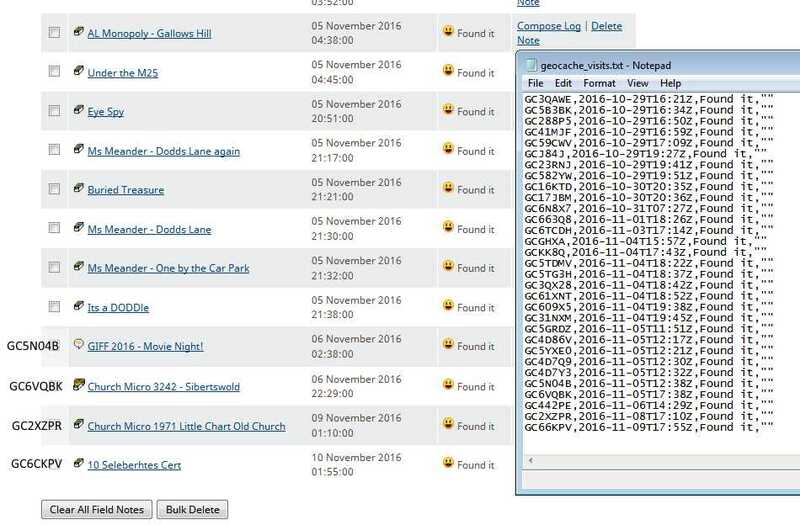 Everything I logged yesterday (November 9th) was changed by the site to the following day (November 10th), on the afternoon of the 9th. My first reaction was "today's the 10th?! ", that therefore I was writing the wrong day on the log sheets. Also, the Travel Bug dips were wrong, being based on the cache logs. But there were only 5 logs to correct, no big deal. I edited the dates to change them all to the present day. The geocache_visits.txt file was correct, the site was wrong. I'll be more careful about what the site is changing. This happened before. Hello, same Problem, all Caches in the fieldnote have an other time & date. I didn't change anything in my gc settings since last year. I am from Germany, my timezone is set corectly to "Berlin" UTC +1 hour. I have emailed support a link to this thread so hopefully we can get some feedback soon! Is there any chance of this being sorted please? I am being affected by this as well. Yes, Groundspeak confuses behind Zulu with ahead Zulu time. Loading the Field Notes via the Api gives no issues. It's the same with my fieldnotes, so I get wrong log date on the logs produced from this. I guess that Groundspeak is setting the included timestamp as its local time, While this is definitely GMT/UTC. The interpretation While uploading a bunch of fieldnotes to prevent duplicates is working well. The cut off timestamp is set correctly. I would just like to confirm that I also see this bug. It has worked in the past, but now somehow it does not. I am a bit behind with my logs and I can confirm that the uploaded logs have been correct at some point, and that the bug also includes times that have previously been displayed correctly at the field notes page. From my perspective: Just revert to what worked. The field notes feature has been working correctly just a week ago, and now it doesn't. That is 10 hours ahead of what it should be. Also I have this issue: All times shifted now by +8h, also today's upload. Even already uploaded Field Notes waiting there for some time to be logged, have now the shift. This for sure wasn't the case 1 week ago. I've noticed that field notes submitted through the API (via Cachly or the "Classic" Groundspeak app) used to be 8 hours BEHIND my local time zone (US Eastern). As of a couple of days ago, field notes I submit that way now have the correct time. Notes that I upload from my Garmin, however, are now 8 hours AHEAD of local time, where they used to be correct. I wonder if they made a change to "fix" the time stamps submitted via the API, and in the process, inadvertently broke "classic" field notes? I can confirm, that field notes uploaded from my Garmin GPS today were shifted 8 hours AHEAD. E.h., cache GC6NZ44 is listed in the Garmin's field note list correctly as 2016-11-13T15:38Z (it was 16:38 local time = CET). However, after uploading the field notes via the website, the showed up on the field notes page as 2016-11-14 00:38 (and I had to change the log date manually to the 13th). Thank you for contacting Geocaching HQ. At the time you attempted use Geocaching.com's website or apps, we were experiencing technical issues. They have now been resolved. We apologize for the inconvenience and thank you for taking the time to let us know. I have pointed out to them that the issue they seem to be refering to has nothing to do with what we are experiencing! Well my Field Notes are still wrong so what are we supposed to do? Upload them again? I'm way behind in my logging and everything is all over the place because of this "technical issue". We are aware of the Field Notes issue. We apologize for the inconvenience and hope to get this resolved soon. Any information you can provide is helpful. My logs show that the issue have been around at least since okt 30. Possibly earlier. As of 2016-11-17T16:43:17+01:00 the problem is still not fixed. Any updates as to what happens with this issue ? This has been bugging me for a week too... thought it might be my app, nope. Tried again just now with 4 caches from last night. I'm EST, UTC-5 as set in my profile. The +8 difference may be due to the Pacific 'home' timezone of HQ in Seattle. If all dates are stored in the database in their local timezone, perhaps something with the conversion of field notes to PST has become buggy, adding +8 to the timezone. That is 10 hours ahead of UTC (Zulu time), 9 hours ahead of UTC+1:00 (Europe/Copenhagen). My bad. Edit: It may even have been 8 hours since Daylight savings time was in effect in my local area at the time (2016-09-28) which would set the local clock at UTC+2:00 for a total time difference of 8 hours between actual local time and the time displayed at the field notes. Hey all,just want to give you an update on this. Our engineers fixed this bug yesterday. All new field notes will display correct times now. Field notes that were created before the fix will still display incorrectly due to how they were saved in the database. Everything still set to Eastern time (app and profile). ETA: Tested again via API after unlinking my profile from the app and relinking. Same result. Interesting. Maybe it's treating the API differently than the website. I just created a test field note in a text file and uploaded it via the website, and I got the expected results. With my time zone settings set to PST, it correctly adjusted this to Nov 17 10:00 am PST. But surely if you have managed to break all our previously uploaded field notes (before you made the change) you guys can fix them by making the relevant change to the time on the previous logs and then implement the fix? I'm not mightly keen on having 350+ field notes that will each have to be checked before I can log them. EDIT: uploaded 4 field notes and they are showing the correct time and date. Yeah I really don't know. Just tried again this morning - app is Geosphere, using the Live API. Has the field note time on the website always been displayed in 24 hours hh:mm:ss format? For some reason I don't recall ever noticing the seconds before, heh. Viewed it as an exported GSAK note and as GPX. Time is stored as 2016-11-18T22:00:33Z which means after uploading gc.com is pushing it by 3 hours, but it is correctly stored locally as converted from 5pm Eastern to GMT. The problem can't be on my app's end. You're definitely sure that your geocaching.com profile is set to UTC-5 Eastern? That's the setting that would govern how much the UTC is adjusted when the field notes are uploaded. If it's set to that, maybe try changing it to something else and then back to ensure it's properly recorded in the database. Yep. Haven't changed it at all and my preferences still read UTC-5 Eastern. Just changed my online profile timezone to UTC and uploaded a new note. App: 7:53pm Nov 18. Web: 8:53am Nov 19. Switched back to UTC-5 and uploaded a new note. App: 7:54pm Nov 18. Web: 3:54am Nov 19. The app's timestamp pre-upload is the proper time converted to UTC. But the timestamp on the web is still always incorrect. Yep. Seems to be fixed. 11:38:00 (UTC) results in 12:38:00 (UTC+1). Thanks! 1) OK, new uploads from yesterday are Ok. Now it ist working again, thx for the fix. 2) The Uploads from the last 2 Weeks with wrong dates, could not be fixed, ok, sad but ok, the last two weeks i think i/we can corrected the logdate from hand. 3) BUT WHAT ist with the old fieldnotes ? that from the last 1-2 years ? the Time stamp was right until the last month. 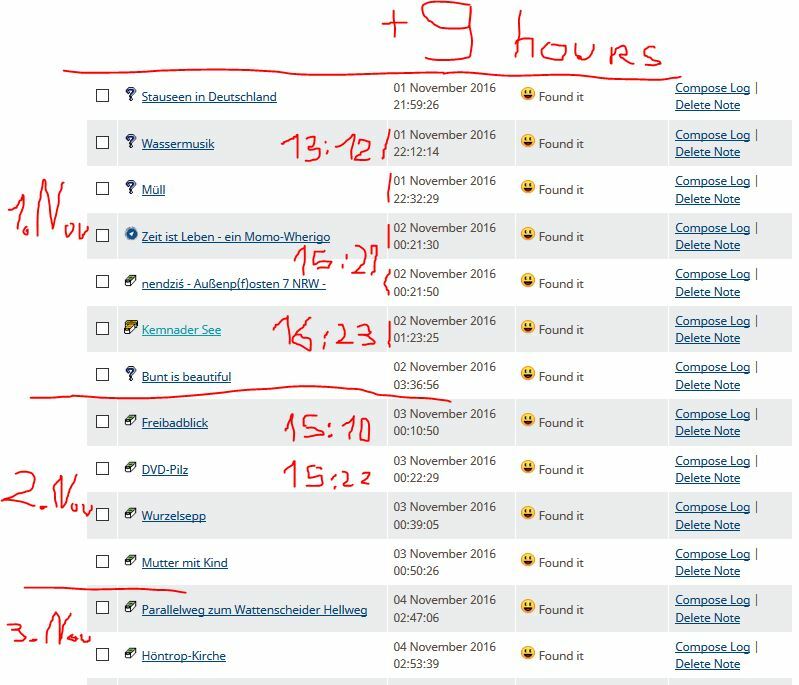 WHAT happend to this old data (the Filednotes uploads before months or years). that Time was allright for 2 years , and know all damaged ? WHY ? Pleas FIX, see the picture. Hope that can be fixed, too. Ok if things are actually getting fixed over time, then somehow it's only applying to some people and not everyone. Losing all hope that Groundspeak would eventually make previously uploaded field notes display correct time again, I cleared them all out and uploaded anew. They seem to be all correct now. Upload the file with the field notes you want to keep. This may be somewhat inconvenient but there you are. It seems to work. Can you describe how you're testing? I don't regularly use Geosphere for caching, so I can't figure out how to upload field notes as field notes (it uploads it as a full log). If you can describe your methodology step-by-step, I can try the same thing and see I get a similar result. Just create a field note for any listing in the app. Then when you view "Notes & Logs" and upload the log as a field note (don't post it as a Log immediately; find that default option in setttings), you'll see it waiting in the Field Notes page of gc.com. Pretty straight-forward. It's never had a problem like this. If I export the field note from the app to either gpx or gsak data, the timestamp is valid. But after uploading, it's still being adjusted forward 8 hours. I use Cachly and when I just tested uploading a field note vs posting a log from that app it shows the field note on geocaching.com as the correct date/time as the app uploaded. I'm in NJ on ET and not on the west coast PT and it shows 7:55am which is my local time. I tried everything again. Disconnected my account from the app, and changed and re-saved my profile timezone. -Geosphere: I submitted a field note, and the time shown on the website is 8 hours ahead of the actual time I submitted it. This replicates the behaviour seen by thebruce0. -Cachly: I submitted a field note, and the time shown on the website was the same as the time I submitted it. No fault found. -Geocaching Classic: Same result as Cachly - no fault found. Based on the fact that two API-using apps worked correctly and one didn't, it doesn't seem like the API or anything server-side at Groundspeak is at fault. It seems more likely that Geosphere is doing something different and incorrectly handling time zones. Hmm... I always thought Geosphere was using the api for field notes... Perhaps not. However, since nothing has changed (AFAWK), the problem may also exist in Groundspeak's 'old' method of submitting field notes outside the API. 2] something changed on gc.com that has broken any/all (presumably) 3rd party tools that upload field notes the 'old' way without using the API (that also doesn't also happen when posting directly as a log). Quick update: Issue still exists. I was in Iceland (+5hrs) for a few days last week, and while the timezones were properly updated on my phone(s), the field notes have been uploaded and are still 8 hours ahead. I just did one today, and same things, +8 hours. We have a discussion about this issue continuing over at Geosphere's forum, attempting to sort out where the problem may lay; currently it's still believed to be something on Groundspeak's end. I'm currently of the mind that the issue is #2: something changed on gc.com that has broken any/all (presumably) 3rd party tools that upload field notes the 'old' way without using the API (which also doesn't occur when posting directly as a log). Are your field notes' time stamps actually given in Zulu (ie: GMT) time? They should. Yes, same as mentioned in post #30. All field notes in the app are stored zulu (at least that is what they show when exported to gpx or gsak data, implying that's how they're handled at the data storage level). When displayed visually on the phone obviously the OS shows the time in the current OS timezone. When in Iceland and I was at GMT all times were visually adjusted accordingly (and when uploaded, they incorrectly showed online as 3 hours off GMT). All of that happened just as expected. So the only issue seems to be when field notes are uploaded to gc.com, and without being posted directly as a log. The issue still exists with field notes I uploaded last night for yesterday's finds, dated +8 hours. Is any developer actually looking into this? Seriously, is anyone looking into this? Another find last night, another +8 hours to the future, another field note log I'll need to manually fix the date. Very annoying; and of course, incorrect. I'd love to help you, but this seems to be an issue with GeoSphere and not Geocaching.com. 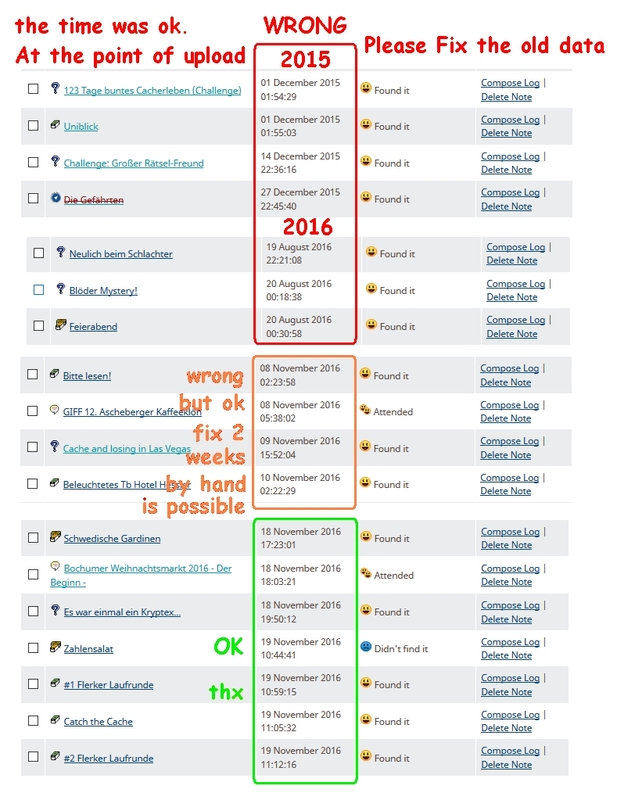 When I submit a field note by other sources - Geocaching.com apps, Cachly, Looking4Cache tested so far - the field note is set to the correct time. Only GeoSphere seems to be bumping it ahead 8 hours.